"Melody Playing For Ukulele Players"
Have you ever wanted to play melody (i.e., purely instrumental pieces) on the ukulele? 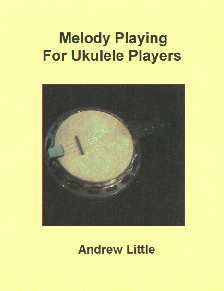 Well, this new 80-page ukulele tutor book will show you how. 8 tunes for you to learn including "Whispering", "Mr Sandman", "It's A Sin To Tell A Lie". All the chord inversions in detail. All the relevant techniques explained. The book comes with an accompanying CD, Minidisc or Audio tape (depending on customer preference) containing recordings of the solos being played. Running time approximately 18 minutes. 14 tracks in total. The price of the book plus either a CD or Minidisc or Tape is £12 including post/packing to UK addresses. There is also a tutor DVD or video cassette (running time 1 hour 30 minutes approximately), which goes through the techniques involved step by step. The DVD or video, depending on your preference, is priced at £15 including post/packing if bought separately. However, there is a discount if you purchase the complete package of the book plus a CD, Minidisc or Tape plus either a DVD or video. The price of the complete package is £25 again including post and packaging to UK addresses.